THE NEAREST MAJOR INTERSECTION TO THE ELGIN SOCIAL SECURITY OFFICE IS RANDALL ROAD AND INTERSTATE 90. TAKE THE RANDALL ROAD EXIT AND PROCEED SOUTH ON RANDALL ROAD APPROXIMATELY 2 MILES TO ROYAL BOULEVARD. ROYAL BOULEVARD IS LOCATED NEXT TO A HOME DEPOT. TURN EAST ON ROYAL BOULEVARDAND PROCEED TO FLETCHER DRIVE, WHICH WILL BE THE FIRST ROAD ON THE LEFT.TURN NORTH ON FLETCHER DRIVE. THE OFFICE IS A SHORT DISTANCE AHEAD ON THE LEFT SIDE OF THE ROAD,A ONE-STORY BUILDING. The Elgin Social Security office is located in Elgin 60123. The following page includes information for this location like the office phone number, hours of operation and driving directions. If you have any interests or comments about your retirement benefits or are interested in making an appointment, call the following Elgin Social Security office. The Elgin Social Security office is located in Elgin 60123. The following page contains information for this location like the office phone number, hours of operation and driving directions. 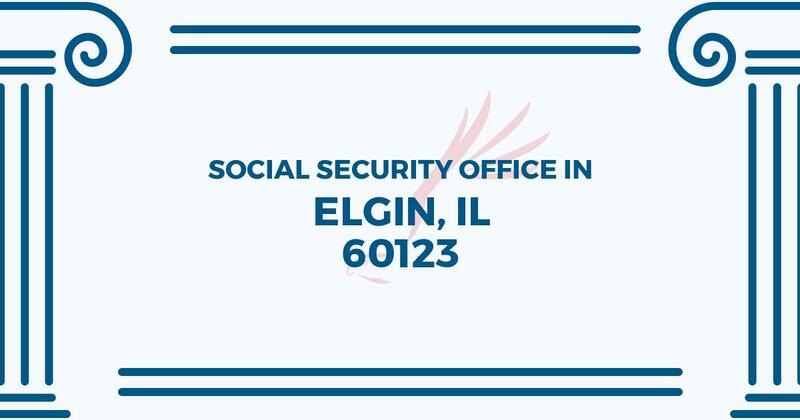 If you have any interests or comments about your Medicare benefits or are interested in arranging an appointment, call the following Elgin Social Security office. I’m not sure where to go to enter a change of address. Please contact me to let me know what I must do.